We all know that the advent of the stylish new 2012 Arctic Cat ProClimb and ProCross models lend themselves to all manner of accessories. Unfortunately, since Arctic Cat worked so diligently to keep its 50th anniversary design under wraps so well, many aftermarket suppliers are just now studying, planning and preparing their latest products for these bold new Cats. There are some pieces that are somewhat universal and others that require possession of an actual model to finesse aftermarket designs. 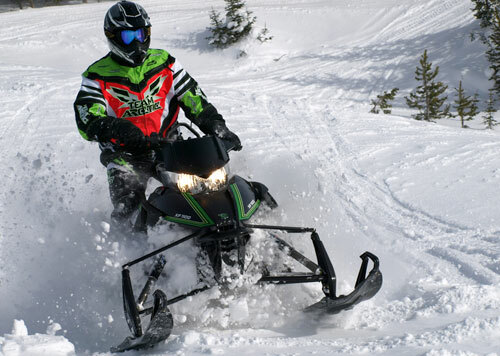 But, if you enjoy a pre-2012 model, there are still many options for adding on to your Arctic Cat this summer. 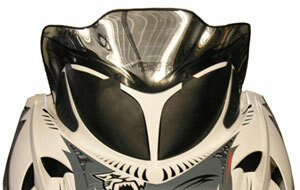 When the new 2012 Arctic Cats hit the snow, we expect aftermarket suppliers to come up with clever new ideas to make those sleds even more customized to Arctic Cat riders. For now, we offer a smattering of add-on ideas. 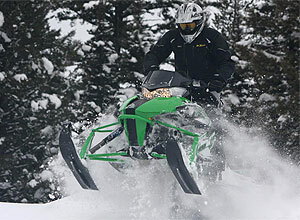 The 2012 Arctic Cat with the 1100cc non-turbo four-stroke will be a prime candidate for aftermarket performance boosts. D&D Power Sports already has a ProClimb Mountain Master pipe in the works. Expect this upstate New York aftermarket provider to be one of the first to fit a power-boosting pipe to the new Cats. D&D already offers the promise of its latest “Monster Power Single Pipe” to add performance to Arctic Cat’s 800cc two-stroke Suzuki-built twin. D&D states: “…This will be the Single pipe to beat.” The New York aftermarket specialist notes that its Procross pipe is designed to run at 8200 rpm while pulling more than 170-hp. The “mountain” version of the new pipe, the D&D ProClimb Mountain Master, features a smaller center section pipe that is said to build heat faster in high altitudes for “…great throttle response.” It is claimed to offer strong mid and top end pull. D&D reports that the ProClimb pipe runs best at 8250 rpm. While it may seem odd that a “flatland” company offers its own “mountain” pipe, you should know that this veteran aftermarket supplier does its own product development, testing from 0-to-10,000 feet. 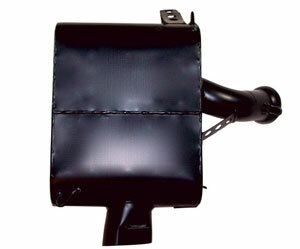 D&D uses its own computerized dyno to develop exhaust products as well as on-site powder testing to develop viable deep snow performance products. The new pipes are priced from US$429.95 and can be ordered online at http://www.ddracing.com/. The Speedwerx mufflers are said to perform the same or better than the stock system and because they utilize the stock outlet location, they require no major chassis modifications for installation. The units come coated with hi-temp black paint or you can specify a ceramic-coated unit for an added cost. With Arctic Cat banking on its 1100cc four-stroke engine as its answer in the “600cc/120-hp” performance category, Speedwerx plans to offer those riders an advantage. Expect the Speedwerx 1100cc (non-turbo) Procross and ProClimb stainless steel exhaust kit to give that motor a nice boost and the sled a reduction in weight. Currently in final development the new single pipe exhaust kit will replace the stock unit and offer improved performance. The new design is expected to retail around US$995. 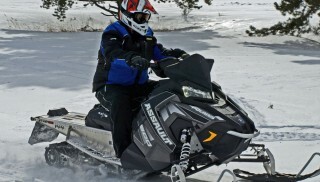 Speedwerx explains that its pipes “…are not built for one run across the lake or on the trail. Our pipes are built to last and our pipes work!” All of the Speedwerx single pipes come with a long lasting ceramic finish that acts as a thermal barrier, keeping heat inside the pipe for optimum performance. 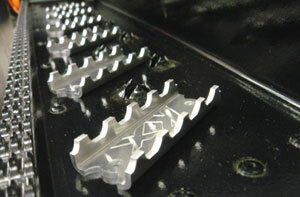 Aftermarket manufacturer Rox Speed FX offers a wide variety of add-ons suited to many sled models. One useful product in addition to its nicely crafted line of handlebar risers is its Rox Universal Grip Strips. The product is an easy add-on to fit virtually any running board with a flat surface large enough to place the Grip Strip. Grip Strips come in packs of six and measure 3.25-inches in length by 1.2-in. wide and .475-in. tall. Grip Strips offer aggressive boot traction and will be useful to both powder and off-trail boondocking riders. Rox notes that you should use caution when installing Grip Strips on sleds that may have liquid-cooling extrusions installed under the running board. Caution. Caution. Starting Line Product’s headlight elimination kit is only for those who will not be riding at night as it replaces the dual Arctic Cat headlights with a set of plastic block-off plates. 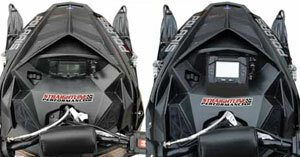 The idea is to reduce weight, which is anathema to powder riders, as you remove the sled’s headlight assembly. This may seem a bit extreme to a “flatland” rider, but deep snow riders seek to eliminate every extra ounce in their pursuit of performance. The newest Arctic Cats feature adjustable instrumentation gauges that can be adjusted to be read from a standup or sit down riding position. But you don’t have to buy a 2012 Arctic Cat to get this improvement. Minnesota-based Straightline Performance offers its EZC Systems dash mounts, which takes your sled’s stock instrument cluster and moves it to a 45-degree mounting angle for easier viewing. The idea behind this product is quite simple — it keeps the rider in tune with the sled as EZC Dash Mounts make it easier to see indicator lights and other performance data. The concept works best for powder riding but is also extremely beneficial for aggressive standup trail riders and off-trail boondockers. The EZC Dash Mounts can be easily seen from both a sitting and stand up riding position. With a suggested retail price of US$69.95, the dash mounts are constructed of high quality materials and designed to offer a finished original equipment “look.” Installation can be done with basic hand tools and is an easy afternoon or evening project.